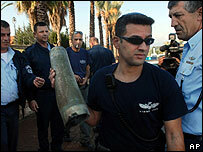 Two rockets were fired overnight into northern Israel from Lebanon, Israeli police say. It is the first such incident in seven months, and comes 18 months after the 2006 war between Israel and the Lebanese militant movement Hezbollah. One Katyusha rocket hit a house in the border town of Shlomi while the second crashed into a nearby street. There were no reports of injuries. The army initially said the blasts had been caused by an old rocket exploding. So far no-one has claimed responsibility for the rocket fire. Israel is on high alert ahead of a visit by US President George W Bush, which begins on Wednesday. Tuesday's explosions happened during a heavy storm and Shlomi's mayor said residents had initially thought they were claps of thunder. The rocket fragments were discovered after daybreak, he said. Israeli Defence Minister Ehud Barak called the rocket fire a "grave aberration". "We do not intend to allow for the status quo in the region to be changed," he said in a statement. "We will study what happened, think, decide, and do what needs to be done." 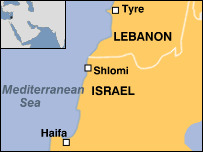 During the 2006 war, Hezbollah militants fired thousands of rockets and mortars into northern Israel, while Israeli air strikes and artillery pounded targets throughout Lebanon. Although correspondents say Hezbollah is Israel's main foe in Lebanon, exiled Palestinian groups have also been known to fire rockets from there. In June 2007, two Katyushas hit an industrial area near the northern Israeli town of Kiryat Shmona without causing injuries. Hezbollah denied responsibility for that attack, and Israel blamed an unnamed Palestinian organisation. The UN peacekeeping force in Lebanon said it was investigating the latest incident. A Lebanese army spokesman and Hezbollah declined to comment.